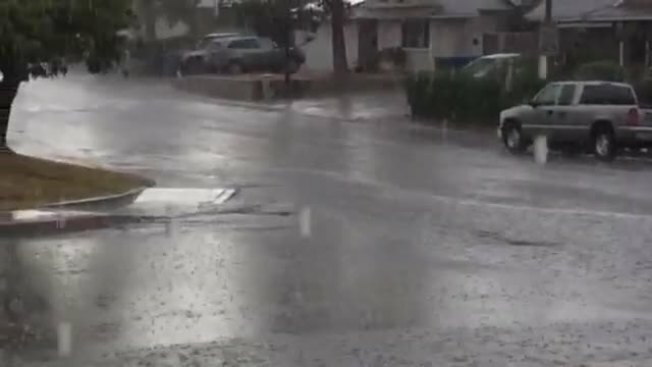 A powerful storm cell moved through San Diego Friday bringing thunder, lightning and heavy rain. The storm system appears to be small on radar but it is packing a punch, bringing rain to Eastlake and Otay Ranch with the threat of rain from El Cajon to Poway. Cal Fire has a few extra personnel on staff because of weather pattern. It's cloudy on Laguna Mountain but no reports of rain, thunder or lightning. There was some rain in Pine Valley earlier according to folks at the Laguna Mountain Lodge. The storm brought .15 inches of precipitation to Ramona and Mt. Woodson with .13 inches in Julian, according to NBC 7's Whitney Southwick. There is a large storm system off the coast of Baja heading north. It didn't take NBC 7 users long to let us know where the rain was falling and where it was headed. Tony Mitchell sent us an update on Twitter, "Thunder, heavy downpour greets El Cajon this morning! I like it!" Julie Williams of Lakeside told us on Facebook that she loved hearing the thunder this morning. In the South Bay, Casey Marie posted this update to our Facebook page, "I hope it rains all month! We are hearing some thunder in Otay ranch part of Chula." Rain from a pop-up thunderstorm falls in Spring Valley in this image from NBC 7 user Kelly Lenahan, Friday July 25, 2014. We even got reports of hearing thunder in Pacific Beach, Tierrasanta, Hillcrest and Paradise Hills. Got storm images or video? Upload them here, share them with us on our Facebook page or tag them as #NBC7 on Instagram. Check back for updates on this developing story. Download our free mobile app for storm information and alerts.